Oh, Don't you just enjoy decoration your home for Christmas? 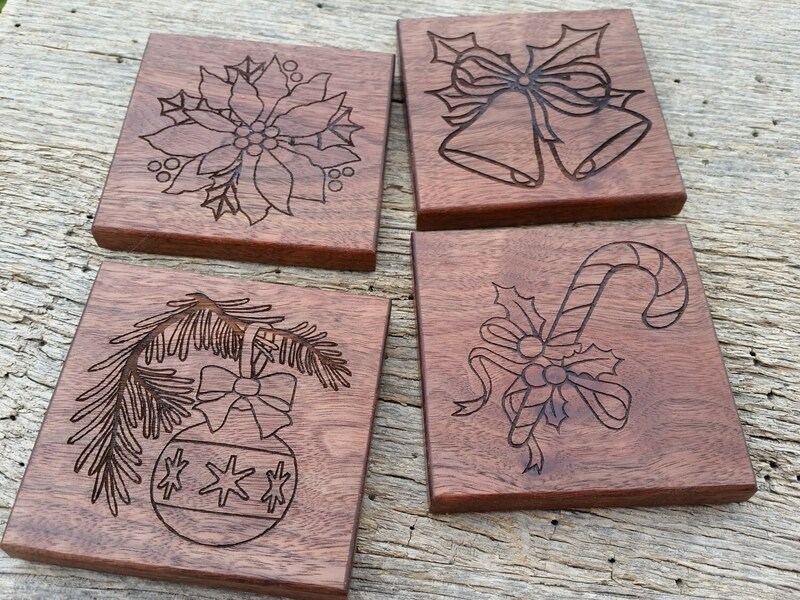 We decide to create this beautiful coasters that are engraved with a globe, poinsettia, candy cane and bells all the beautiful decorations we use for the holiday. Add them to your holiday table decor for the perfect finish touch. Having company this holiday season? Serve their drinks on these beautifully crafted and engraved wooden coasters. Each of our coasters are made by us from rough saw lumber, that it's plained, sanded, cut, sanded, routed, seasoned with protective oil and engraved. All work done in the beautiful USA. Want to give the set as a gift? We can engrave a special message on the back of the coasters if you would like. Want them custom engraved? Just let us know what you would like us to engrave on them and we will try to do it for you.